This slow cooker corn and shrimp chowder is a winner in my book. 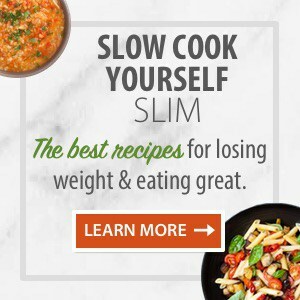 I adapted the recipe slightly from one in Fix-It and Forget-It New Cookbook: 250 New Delicious Slow Cooker Recipes (affiliate link) by Phyllis Good. The recipe called for 12 ounces of cooked shrimp. I had only about 8 ounces of cooked shrimp in the freezer. So, I supplemented with about 4 ounces of smoked salmon that was sitting in the fridge needing to be used. The smoky fish complemented the corn and shrimp nicely in this chowder. I remember reading somewhere (don’t ask where) that pureeing some of the corn made corn chowder more “corny” tasting. So I combined about 1/2 the corn and 1 cup of water in my Vitamix blender (affiliate link) until it was liquified. This step is totally optional. So, skip it if it seems like too much work. 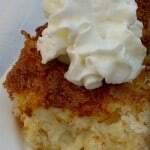 And I used 2% evaporated milk instead of regular to save a few calories. The recipe didn’t say when to add the diced cooked bacon, so I added it at the end along with the chives. I contacted the book’s authors about the oversight and they said they will be sure to fix it before the book goes back to print again. 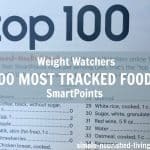 According to my calculations each serving has 279 calories, *7 Weight Watchers PointsPlus and *8 SmartPoints. 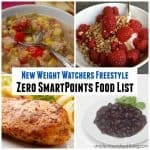 Following the new WW plan for 2018, this chowder is now *4 Freestyle SmartPoints. I love when that happens to a favorite recipe! Served with warm crusty bread, this slow cooker corn and shrimp chowder made a satisfying supper that both Rod and I enjoyed. I will share some of the leftovers with Mom and get her opinion too. Enjoy! 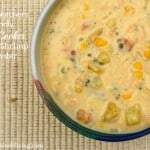 If you’ve made this corn and shrimp chowder, please give the recipe a star rating below and leave a comment letting me know how you liked it. This easy, healthy and delicious slow cooker corn and shrimp chowder was a big hit when I made it recently. Ideal slow cooker size: 3-1/2- to 4-Quart. In a small skillet, fry the bacon until crisp. Remove and drain the bacon and set it aside. Add the chopped onions to the bacon drippings in the skillet and cook, stirring often, just until they soften. Add the potatoes, corn, Worcestershire sauce, paprika, salt, pepper and water to the slow cooker. Cover and cook on LOW for 2-1/2 to 3-1/2 hours, until the potatoes are soft. Stir in the shrimp and evaporated milk. Cover and cook on LOW for 30 minutes more. Just before serving stir in chives and reserved cooked bacon. I used a combination of smoked salmon (4 ounces) and cooked shrimp (8 ounces) instead of all shrimp. It was very good. I also pureed 1/2 the corn with 1 cup of the water called for before adding it to the pot. I read somewhere that this will make your corn chowders more corny tasting. Source: Slightly adapted from Fix-It and Forget-It New Cookbook: 250 New Delicious Slow Cooker Recipes (affiliate link) by Phyllis Good. 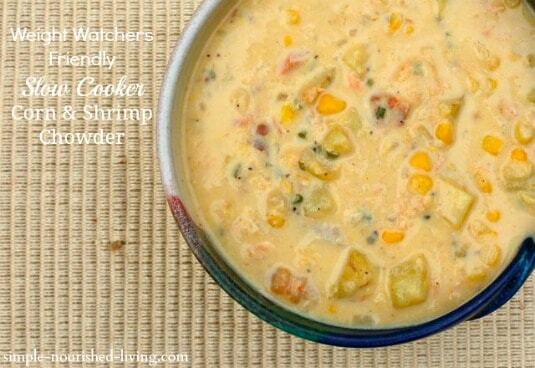 How many servings does the Slow Cooker Shrimp and Corn chowder recipe make? It sounds delicious and perfect for a cold evening. Thanks. I’ve never thought of doing corn chowder with seafood. I’m not usually a shrimp fan, so I am glad to know it worked well with salmon too. I’m excited to try it out – I wonder if other types of fish would work. 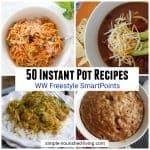 I love your crockpot recipes this month! 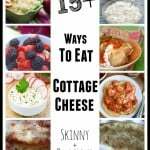 I love all of your recipes and I can’t wait to try this one! I’m using frozen shrimp and frozen corn and just wondering, should the shrimp or corn be thawed before adding them in? I’ve never tried it with frozen corn and/or shrimp. I think it should work either way, but if frozen, it will take a bit longer to cook, of course 🙂 Enjoy! This sounds delicious. 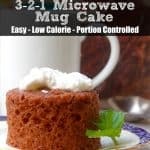 I have a similar recipe that is much HEAVIER, and it is awesome. I look forward to reducing the fat and calories by using your version. This is very good. Added a little Old Bay, a pinch of dried peppers and just a touch more salt and this will be made again. I am wondering if shrimp could be substituted with smoked sausage or even ham making this a good base chowder. Thanks. I think both smoked sausage and ham would make delicious substitutions for the shrimp. Love the additions of Old Bay and dried peppers! Thanks for the delicious suggestions! This is delicious! Thank you for sharing! You are so welcome, Christy. This recipe took wayyyy longer to cook for some reason. It was near 5 hours, and the potatoes still weren’t done. Had the right size crock pot and definitely cut them small enough. Ultimately, we ate it sooner than later and it was still very good. Added garlic powder and cayenne pepper for a kick. Would make again, but would plan it differently next time. I just calculated the smart points and they are 7. If it’s posted already, sorry, I missed it. In my crock pot right now! Just made this last night – really good! Definitely a keeper in the recipe file! Hi Martha. I have never used the type or brand of slow cooker you suggested/showed in this recipe (which sounds really good, by the way). Do you really like it over the more usual format of one size, one crockery insert, etc? What do you find to be advantages of this format? I liked this slow cooker and used it for years, until it stopped working. I don’t think Hamilton Beach makes it any longer. It really provided a lot of versatility in minimal space. Like having a 2-quart, 4-quart and 6-quart but taking up just the space of 1. The shrimp chowder sounds very good but can you please put a recipe in for Manhatten Clam soup some time? How about a regular Clam Chowder? can I make this chowder a few days ahead and keep in frig? Love it. So did all my friends and family I shared it with. Made this twice and shared with family and friends. Love this.